And the tree house is such a lovely set aswell. Great finds! Today I added the rest of the amusement theme to my collection and got a dino set too. I should have gotten 2 more motors but I didn't think about it. 40% off so not a bad haul! Amusement park and dinosaurs? Going to make a jurassic park? Nice buys. I've been playing around on eBay again and picked up some people and a few small accessories this weekend. Still a long way to go to get everything that I want and need to make my zoo a reality. I was looking over my "inventory of animals" today and realized that I haven't updated it in a while since I've added a few more. 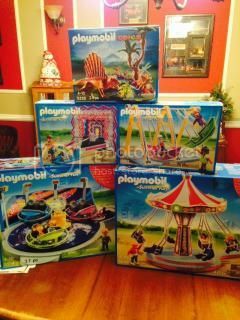 Does anyone else keep an inventory of their playmobil pieces? I started a spreadsheet of mine - link in my profile - but haven't bothered to keep it up. Feels too much like work. I'm doing it just for the animals, and have quickly found how not up-to-date it is. So when I quickly looked at it before deciding to buy something off eBay, I saw that I had the need. When I physically looked at my bin of animals I discovered that I had enough of it. Now I was looking last night and have decided that I need to start customizing some of the animals that I want in my zoo. And then find some way to make some beautiful zoo signs like the one seller has on eBay for some of the different critters (unfortunately the words are in Spanish). And I really need to get working on the infrastructure for the zoo. I still need a bunch of things! Nice collection! I'm looking forward to seeing your zoo. How did you get all those blue-footed boobies? I want some so bad, I don't even have one yet. I just can't justify buying a $60 set for one bird. Does anyone know if they are available as spare parts in Germany?